Sandy Petersen is the undisputed authority on the Cthulhu Mythos in games as the author of the groundbreaking game Call of Cthulhu, the first game ever to bring H.P. Lovecraft's work to the gaming world. He now proudly presents the definitive and ultimate guide to bringing Lovecraft to the high fantasy, sword and sorcery worlds played using the Pathfinder rule system. Here, your band of heroes can now fight (and maybe even defeat) monstrous horrors and bizarre, inhumanly advanced races in adventures featuring these unique entities, their magics, and the alien technologies accurately portrayed from Lovecraftian works! 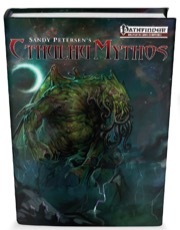 This core rulebook features a bestiary with over 100 creatures, monstrosities, and Mythos Entities authoritatively revised and updated for use with Pathfinder, plus Plot Hooks and Campaign starters, information on Mythos Alien and Bizarre Technology, new expansive Insanity Rules, and details on Cults of Cthulhu and the Necronomicon and other blasphemous Tomes, as well as new Rituals, Spells, Archetypes, and Class Options. A bestiary with over 100 entries, almost half never before seen in a Pathfinder book before. Over 25 Mythos Entities: Creatures in the Paizo's Pathfinder Bestiaries now authoritatively revised & updated in this book. Additionally, the original entries as found in the Bestiaries are also included for easy reference and comparison. 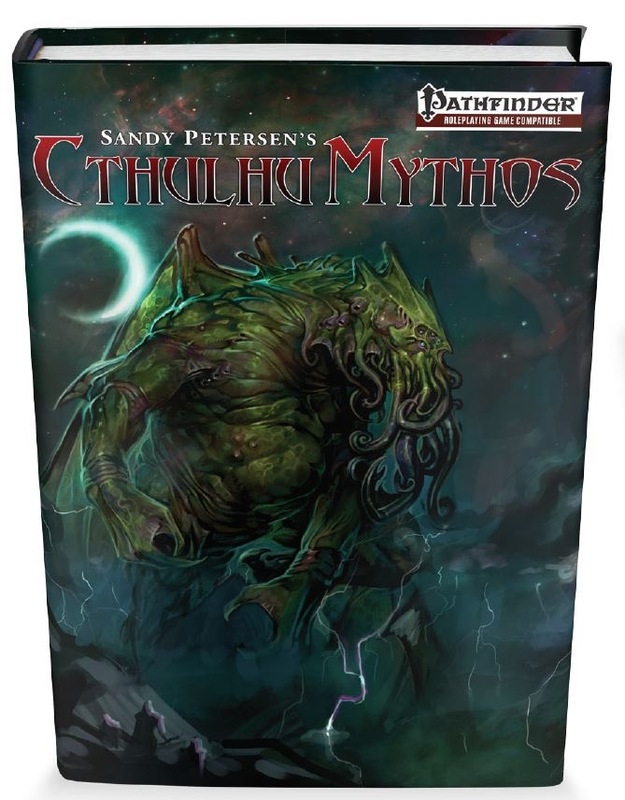 Over 50 NEW Mythos Entries: Creatures from the Cthulhu Mythos that have never before been published in any Pathfinder Bestiary. Over 40 ‘Unusual Suspects': Creatures that could (and maybe should) be in the Cthulhu Mythos, found in the pages of the current Pathfinder Bestiaries. Some have been updated to reflect our new rules. Adventures: Plot Hooks and Campaign starters by Sandy Petersen and others. How to run horror in a heroic sword and sorcery setting by Sandy Petersen. I went in on the Kickstarter, and my copy recently arrived. It's truly fantastic. I strongly recommend it to anyone interested. We play in Strange Aeons now and one of our players referred to this book while creating his character. Using these materials, he created incredibly cool and thematic 'hero' (objectively, the best in the group). Shortly after the beginning of our games I read this book and was amazed at the quality of the work. It looks like the best of Paizo's books. My respect to author and advice to everyone - go and take this book, you will not regret it! The book is amazing a must have. Perhaps you´ll think it is kind of expensive, but it worth every cent spended on it. The only thing I could complaint is the art of monsters, I would love to see the art in Cthulhu´s Portfolio, but the miniatures from Cthulhu wars are ok.
the revised monsters from pathfinder are amazing, gugs now are scary as hell. Disclaimer: I backed the Kickstarter campaign that created this book, and paid for both physical and digital copies of this product. At the time of this review, the physical version was not available. As a backer, I received my digital copy of this product significantly before its public release. Chapter One is the 'Getting Started' bit and dives into a few important things, especially how to use the book, a brief overview of the mythos (for the two of you who don't already know), and a discussion on how to properly bring horror to what is, let's be honest here, a heroic fantasy game. If you're looking for a true horror feel in your game, not just a few monsters with more tentacles than most, this section is required reading. Memorize it, even. Chapter Two introduces Mythos Races that people can choose from. Dreamlands Cats are definitely the most unique, because you are playing an actual cat. Good luck with any Strength-based builds. Dreamlands Cats have scent, bite and claw attacks, the ability to physically travel to the Dreamlands, and nine lives. That might be important, given how fragile they are. The next race is the Ghoul - which is not to be confused with the undead ghoul monster, despite the cannibalistic similarities. This race is living, with bonuses to Constitution and Intelligence, but little Charisma to speak of. Their Death Scent allows them to locate food (especially undead, which they can locate from up to 60 feet away - handy for dungeon crawls! ), and they can feed on old meat for bonuses. Being immune to nonmagical diseases definitely helps with that. The third race is the Gnorri, who are large monstrous aquatic humanoids. Their most unique feature may be the ability to change how many arms they have - two arms gives them a bonus to Strength, three has no ability changes but lets them hold something else, and four lets them hold a lot more at the cost of a drop in Constitution. They are amphibious, but slower on land and faster in the water. The final race, Zoogs, are described as "widely dreaded and sometimes mocked from a safe distance". The book points out that all of the creepy legends are quite well-founded, and they really are dangerous little things. This race is especially big on treaties and agreements (which they consider sacrosanct), and this provides an easy way to integrate them into an Adventuring party - just have them promise not to eat party members, not to eat the party's familiars, and so forth. Zoogs are quick and smart, but not very strong. As small creatures, they get added bonuses on agility-based things - including a natural climb speed - and they make excellent rogues thanks to their Trap Mastery. All of the races in the book come with robust writeups that describe personalities, history, culture, relations, and the like. Chapter Three, Character Options, focuses on exactly what it sounds like. The section opens with a variety of mythos-themed archetypes (and the rules for applying them, if your group hasn't already gotten those). Examples include the "Mad Artist" Bard, the "Cultist" Cleric, and the "Researcher" Rogue. Following this, we also have a few options for companions, including mutated versions of normal creatures and original companions like the Shantak. A Mythos Eidolon was included - so, did you ever want to summon and attack your foes with a protoplasmic mass of angry flesh? Yup, that's a thing now. The book continues this section with a variety of new feats, mostly oriented around the new races. (Ghouls can heal from negative energy damage, anyone can go to the Dreamlands, magical items can be fused into a Dreamlands Cat's body, etc.). They're definitely worth taking a look at if you plan to use this book in your game. Past that is one of the more unique options in the book - playing primarily as a familiar, complete with your own Sorcerer as a companion. Another archetype, the Prowler, makes melee combat more viable for cats, while the other races have their own archetypes for added fun and flavor. After ALL of that, we finally reach Chapter Four, Insanity and Dreams. Dread is a new mechanic governing how badly you're messed up by Eldritch things, and all characters get a threshold of 3 + Wis. Exposure beyond the threshold has effects ranging from the minor (Disturbed, which has no in-game effect) to fainting and having a Heart Attack (2d6 Con damage). Characters can make a Will Save to avoid dread, and the book notes that it should only be used for particularly dangerous or dramatic things, rather than every time people encounter something creepy. Overuse takes away from the impact, after all. The book also recommends the use of the Dread Resistance rule (which, basically, says that creatures immune to fear stuff get a bonus to dread). A more long-term condition is Insanity, which can be acquired in multiple ways and manifests in the form of phobias, obsessions, erratic behavior, and the like. This is an alteration of normal insanity rules, and should also affect things like the insanity spell. Tables are included to help randomize the insanities, and - ahem - the art in this section demonstrates one of the many reasons this book is not for children. The latter part of this chapter focuses on the Dreamlands, an important part of the Mythos. Characters normally don't remember what goes on in the Dreamlands, but some - like Dreamlands Cats - always remember. While the Dreamlands exist as a distinct plane of existence, they are almost impossible to reach by transport magic and the like (Plane Shift and Gate auto-fail, and even Wishes may fail). Time is distorted in the Dreamlands, and people (all of whom visit there when they sleep) can lead very different lives. This offers significant potential for having characters wake up with absolutely no idea what's going on - could be fun. Several options - including items and feats - make it easier to remember what goes on. Chapter Five focuses on magic, beginning with a variety of new spells. (These include things like shrinking a person but not their gear, getting rid of a target's highest available spell slot, and sending a dream of Cthulhu to give someone an insanity). Some of these are pretty nasty - say, implanting a Dark Young into somebody - and regularly using some of these might well drive characters towards Chaotic and/or Evil. No, really - those are fairly common descriptors among the spells. Characters from Occult Adventures are thrown a bone, here, and can take many of the new spells. Beyond the spells, we get a section introducing Rituals, which are designed to be done as a group and can have significant effects. Rituals go from 2nd to 9th level (no easy 1st level rituals, sorry), and have effects ranging from summoning up an uncontrolled entity to scrying the Yellow Sign (of Hastur) on things. Defense-minded characters will probably want to look into the Create Elder Sign ritual, which can ward objects and places. Or, y'know, you could summon Azathoth. ...This is not recommended, since it usually leads to the destruction of the planet in short order. In Chapter Six, we're introduced to Mythos Items and Artifacts. These range from the relatively mundane (a teapot that can only poison drinks for some people) to the more worrying (flasks that can turn into proto-Shoggoths) to the quite concerning (a drink that heals diseases and physical ability damage, but starts to turn you into a monster unless you succeed on a Fort throw). Outside of these "normal" items, we have some alien objects that can't be easily manufactured or recharged, only found. Some of these are mildly useful (a drink that makes you 1d10 years younger), others are more useful (a drug that lets you ask a question about the past or future, a gate that teleports to a specific other location, etc.). Up next is one of my favorite parts of this product - the Books of the Cthulhu Mythos. I love eldritch grimoires, so having a section with them was a special treat. Actually reading these tomes requires research, and you get a bonus over time if you keep studying it. Of course, it's a Mythos tome, so it's not that safe - each research check also has a chance of causing Dread (a rare case where it's commonly inflicted), but overcoming this may also award XP. Each book offers a variety of benefits, including bonuses to certain skills, knowledge of spells and/or rituals, and occasionally specific and unique effects (like learning a spell you normally couldn't have). Tomes like the Book of Eibon, the Celaeno Fragments, and (of course) the Necronomicon are included. That last one is, perhaps unsurprisingly, the most complex and potentially dangerous book. That said, mythos tomes are designed specifically to attract the unwary. Researching them isn't actually that hard - they do give you a bonus to it, after all. There's just, y'know, the possibility of going insane, dying, or calling up things far beyond your ability to control. Fun for the whole cult! From there, this book goes into unique magical items. Some are fairly specific in nature (like the Chain of the Deep, a neck slot item that gives a bonus to Constitution but only works for certain types of creatures), others are useful for adventuring (the Silver Key, which helps when visiting the Dreamlands), and a few are quite powerful indeed (the Lamp of Alhazred, which can project windows to other times and places... and perhaps even allow teleporting to them). The items section finishes up with a couple of Artifacts. The R'lyeh Disk fragments provide benefits to mythos entities (or can summon Cthulhu if they're put together - and no, of course he's not under you control), while the R'lyeh Tablet essentially has people Astral Project to R'lyeh and may even let them bring things back. Lots of plot opportunities, there. Meanwhile, the Shining Trapezohedron acts as a highly accurate Divination spell (that you can use at-will), but also has a chance of terrifying the watcher or, worse, summoning an avatar of Nyarlathotep. Chapter Seven walks us through mythos cults. Each cult is described in detail and comes with a variety of gifts (benefits and options available only to members of the cult). For example, the cult of Shub-Niggurath may receive living horrors as pets/familiars/companions or Mi-Go technology, while the cults of Nyarlathotep grant different gifts based on the aspect being worshipped (from flight to one-time spells usable regardless of casting ability). These are interesting for tweaking enemies, and equally flavorful if your players are playing cultists. We also get some pages on Tcho-Tcho (a human subculture), Deep Ones, general religious views of mythos entities, and how less-eldritch creatures tend to see the cults. Chapter Eight - and would you believe we're only 40% of the way into this thing? - focuses on the Great Old Ones and the Outer Gods. Unlike the official bestiary entries, Great Old Ones - which aren't full deities - aren't really meant to be fought with this book. Fighting may help banish them, but they're difficult or impossible to actually hurt. Instead, entities get an Elder Influence stat block. This is essentially a targetable area effect with one AC (yes, touch attacks also have to hit it - low BAB classes have almost no hope of doing so aside from spells that give them, like, a +20 to accuracy). For example, Abhoth - Outer God of disease, fecundity, and oozes - has a 300 foot influence with a 50 square foot nucleus, an AC of 40, almost 500 HP, and a +24 bonus to its saves. When it manifests, it spawns Filth (which are similar to proto-shoggoths), and damaging the influence creates more filth. If too many are present, Abhoth absorbs them and heals. Each filth can have a special power or effect, and damaging the area or the filth triggers a wide-range mind control effect. Yes, it's nasty. Yes, it's really nasty. Yes, it's intentional. Elder Influences aren't the sort of thing you can just have a Paladin smite and full attack to get rid of. There's some 26 entities with influences presented, and yes, some of them are worse than Abhoth. (Azathoth, for example, requires accurately dealing over 700 HP in one round - while Great Cthulhu has multiple stages of influence and defeating him only sets him back one stage... so the fight may not be over yet). All in all, the section is about 90 pages all by itself. Chapter Nine gives us the Mythos Bestiary, another hundred or so pages of creatures for parties to face. Note that simple combat encounters aren't always the best way to use these creatures. Many of them honestly don't care that much about mortals, and may not even want to fight unless they really have to. Chapter Ten is an expanded bestiary, generally reprinting content from other sources. Republished content is inherently less valuable, but this is a mythos-themed book, and there's some genuine utility in having most such creatures in one tome instead of having to search through all of your other books. This section is also about a hundred pages - 20% of the book, give or take a smidge - and does include things like Cthulhu's stat block if you want to use it. The book wraps up with an appendixes (creatures by CR - including Elder Influences) and the OGL. Overall, this is a solid product, with few problems and errors. I did notice a couple - for example, there's a sidebar titled "Gamemaster's Note" that deals with the Dreamlands. That's not a problem by itself, but there's an index of sidebars on the front, and the title is vague enough to provide no helpful information when looking at that index. It's a minor quibble, as such things go, but it is a quibble all the same. That said, this book is pretty much everything I hoped it would be when I chose to help fund it. I definitely got my money's worth, and if you enjoy some Lovecraftian lore in your games - as I do - then this is the mythos product to get. It gets 5 Stars, a Stamp of Approval, and my Recommendation. Awesome! I've been looking forward to this. Can't wait to read some reviews. Excited to get this but unfortunately Paizo's insane shipping and handling charges will make me buy this elsewhere. $25 in S&H for a $41 book? Petersen Games charges only $8 shipping and handling. Looks great... I was wondering, is the bestiary (considerably sized as it is) illustrated with drawings / paintings or is it painted miniatures? I'm kinda hoping its the former although everything I've seen from the KS suggests the latter... looks awesome regardless!!! As a Kickstarter backer I'm pretty sure I remember something being said about the images were going to be of painted minis from the campaign. 2 Thumbs up, sounds freakin' awesome. What's the release date for this supposed to be? Looks awesome. Doubt the local store will be able to get it. Have you tried asking them to special order it? In my experience, most local stores are pretty good about that sort of thing, especially if you can pay up-front and go in to pick it up later. I have had major difficulty getting special orders. Most of the stores only order from one distributor and if it's not on their list you're SOL. Huh. That's unfortunate. Well, it's worth a shot, I suppose. Alternatively, a larger bookstore might be able to get it if a local game store can't? Peterson, Pathfinder, and the Cthulhu Mythos? Yet another book on my 'gotta get this one' list! Petersen Games website indicates August 2017. Will it be available as a pdf as well? I cannot wait to get my backer copy of this PDF. This is going to be awesome! Wait, cats as PCs? I know how fond the Young Gentleman was of felines, but wow, I have to see that when I read this book. Gives me the idea of all the wizardly/witches' familiars in town getting together when their 'owners' sleep, and sneaking through the darkened alleys to hunt down and destroy monsters of the Mythos. Hmm, this definitely got my attention. I wonder if it'll take advantage of either the OGL occultist or psionic material. I just received my minis from backing the kickstarter of this. The minis look amazing! REALLY looking forward to receiving my PDF and book! Kickstarter text-only copies have gone out, which has really only increased my excitement. This book is going to be massive and while I've only peaked at the Great Old One section, Sandy has some awesome ideas for how to use each GOO, and I'm super excited to subject some players James' new type of Great Old One stat block. I'm not going to give out any spoilers yet... but this book is already a home run in my mind sans any art or professional formatting. Well done everyone! Silly question, but will there be electronic versions of this, or will it be print only? And any idea on what the price tag for PDFs will be? It's showing the book as weighing 11 pounds (which sounds a lot to me) so that might change once they get actual copies in and enter the correct weight. It's worth noting that "Paizo's insane shipping and handling charges" are actually "USPS's insane shipping charges" the handling element is pretty negligible. The publisher can take a hit on shipping because they pay even less than wholesale for the book. I wonder if this will be at Gen-Con? I am soooooo looking forward to this. It's definitely on my birthday/Christmas list. The bestiary images are painted miniatures. I missed the kickstarter, but I can't wait to get a hold of this! I'm hoping it meshes well with the Mythos work that's come before such as in Wake of the Watcher, Strange Aeons and Shore to Sea. From everything that I'm seeing, the answer is "yes." Will a PDF be available for sell? This may be a silly question, but does anyone know the name of the font used in the book's title? I had it on a now dead computer but can't find it online. Yeah, I know August is upon us. I just hope they don't push the release date back, is what I meant. Does anyone have an idea when this month it's supposed to ship? Imagining nothing's shipping on this one until mid-to-late month. By the update on July 13th (Update #79), they were still working on editing the file for production. Once they finalized it, then backers will get their electronic copy then we'll have an ETA on the actual book. It's the middle of August and still no word on shipping. I know they have a lot of work to do prepping these things, but I'm gonna have to start making Sanity checks soon. Right now I'd be surprised if we get it before Halloween.